Worlds #1 Beef Jerky Search Engine! Hang Jerky In Your Oven, Bamboo chop sticks were used to hang the jerky. Thanks to Meyer for the pic. Worcestershire which can be more, you must have enough liquid to cover meat. Brown sugar and corn syrup or molasses can be to taste for sweetness or not used at all (SEE TIP BELOW***). meat. 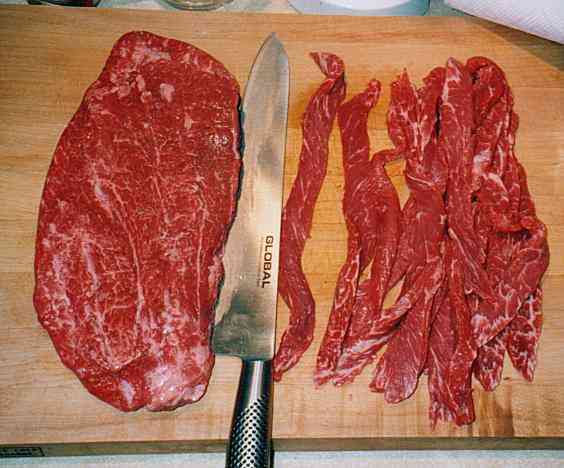 The meat is to be sliced with the grain as thin as possible (approx. 3/16"). occasionally shaking or stirring the meat at least 2 more times. bottom rack to top, from edge to center etc.) The low heat is to dry the meat, not cook it. commercial chemically processed so called meat. more evenly distribute the marinade, without the mess. Our family is really enjoying your recipe, thanks! **Dan Baxter reminded me to tell you to partially freeze the meat to make slicing thin easier! ***Hi guys my name is Steven Tomeno I live in Rochester NY. The stores in my NY area have plenty of Jerky BUT nobody makes it sweet. first I double the brown sugar and I put a couple of cans of Pepsi in with it. I find that Pepsi is sweeter than Coke. Just a hint if you like it sweet. 4 lbs rump roast cut into thin strips. Cook for 4 hours in oven @ 160 degrees. 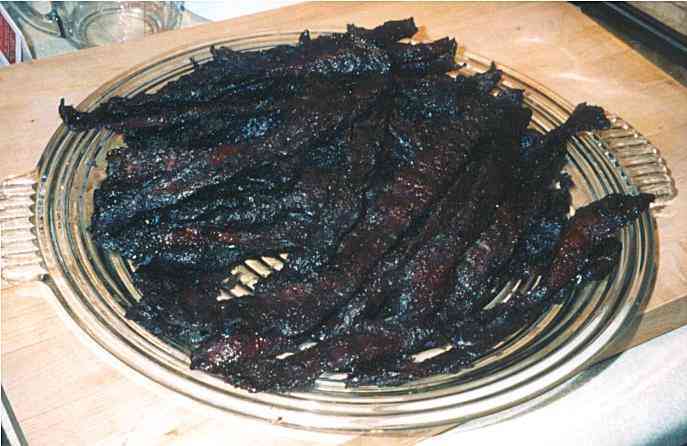 Don't forget to flip the jerky after a couple hours. If anyone makes this please E-Mail me let me know how you like it or dislike it. This recipe is for sweet tooth people. dish washer and toss the foil in the trash when you are done. 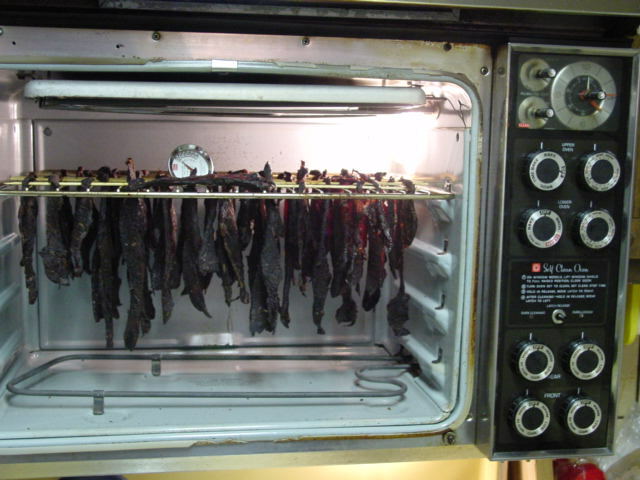 One thing you can do is to hang the jerky from the racks in the oven with toothpicks. Skewer the end of the strips of meat to form a "T". Hang the toothpick across the racks. You can fit a ton more strips hanging than lying flat. jerky for a day or two. I've tried roman meal and white bread, both work. Didn't your Grandma put a slice of bread in the cookie jar to keep the cookies from drying out? Works the same for jerky. from the bread and become more palatable instead of crunchy or hard to chew. However, if you leave the bread in too long it will stick to the jerky. Try it, works for me. see most of the pepper stayed on the meat and that the pepper adsorbed the marinade also. The finished product contained a surprisingly good crunchy pepper-marinade flavor. catch pan below. With this method I could dry about ten pounds of meat at 3/16” thick and 8” long. I set the oven temperature at the lowest setting, on my gas oven is about 160 degrees Fahrenheit. into one cup of your jerky marinade and placed that into the bag with the strips of beef. I marinated that for about 4 days periodically mixing the marinade in order to coat all the strips.